I Spilled My Wine: That time we moved our bed into the closet. That time we moved our bed into the closet. If you couldn't tell by my Instagram pics Saturday afternoon, we enjoyed ourselves. But I promise, our weekend wasn't all play. We've been working on our master bedroom "project" for the past month or so & I'm happy to say, we finally, finally got 'er finished up. But not without a few wrenches. Isn't that how all DIY's go? 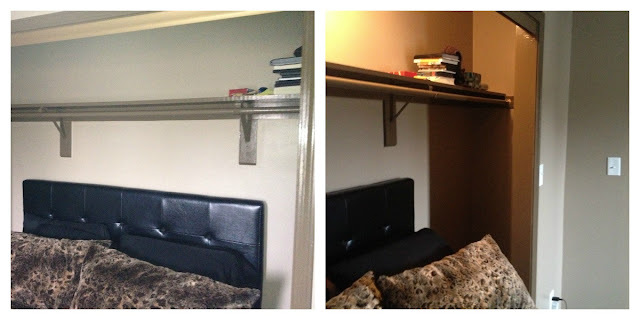 ....so there was no need for the measly old closet in our actual bedroom. So, why not move our bed into it? 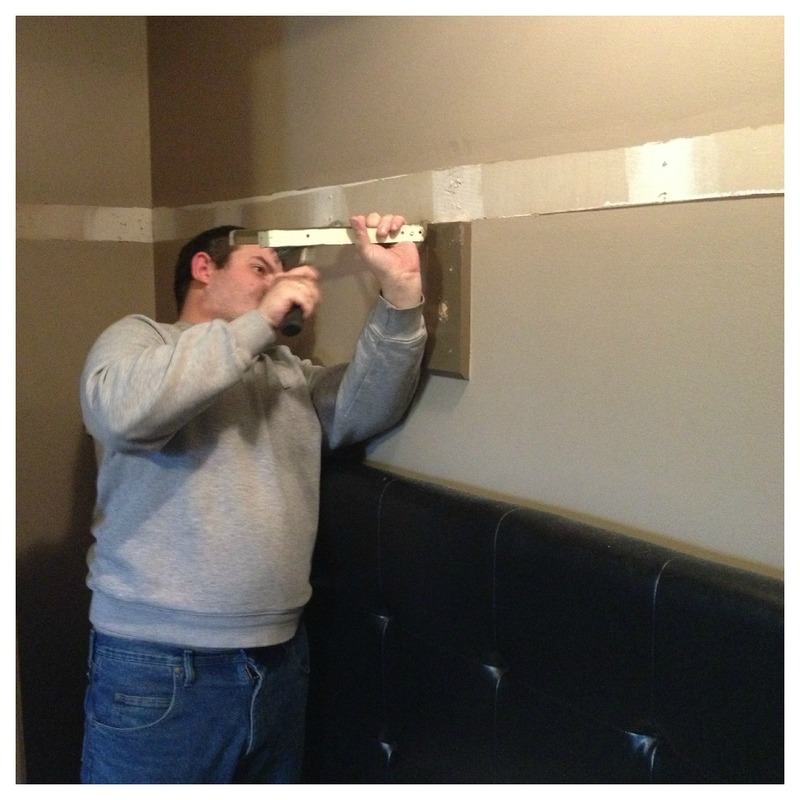 First we had to remove the shelving & rod. Then we had to mud & sand it down. 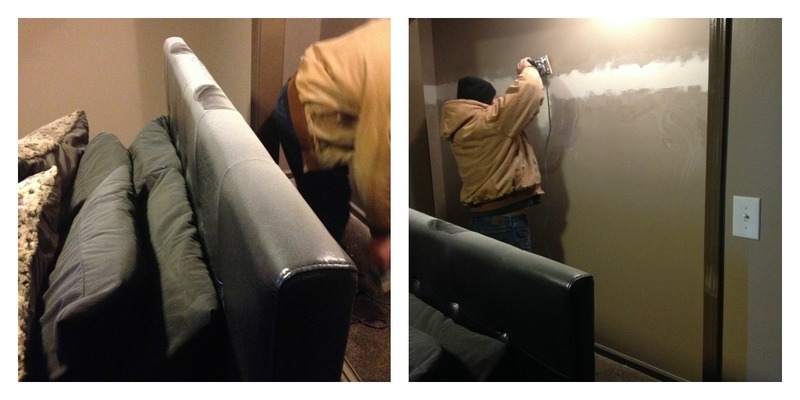 And mind you, in these photos it looks like Jon is doing all the work, but this photo was totally staged. I promise. I sanded the ENTIRE wall myself. And then had to scrub every frickin' inch of the bedroom because that crap gets everywhere! I took a pic of the headboard just to prove it. After we got 'er all sanded down, time to bust out the paint. 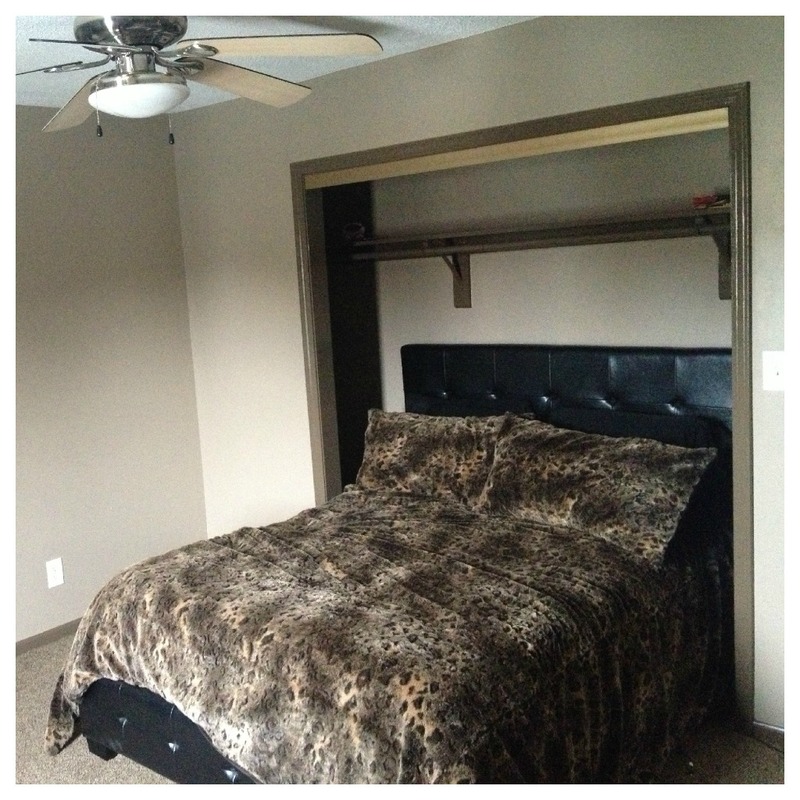 I wanted to paint the closet to match the darker trim & baseboards surrounding it. Instead of taking a wood sample with me to select the paint color, I decided to "eyeball" it. 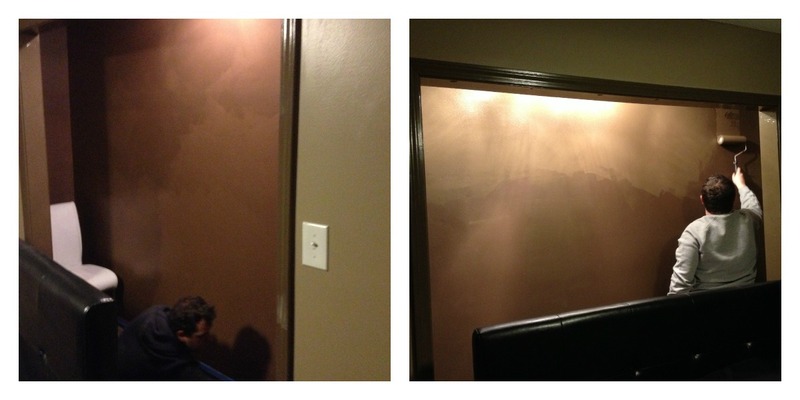 It turned out super red, so we ended up having to paint the entire space. 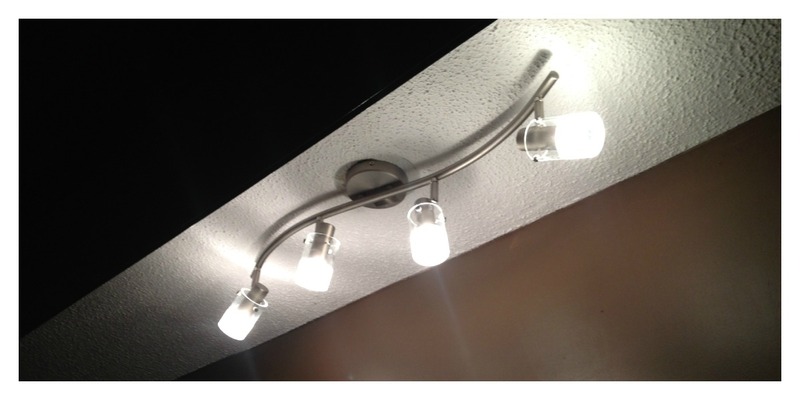 We installed a new light fixture with a dimmer switch. The dimmer allows for a nice ambiance in the room & I just love it. Then off to Etsy I went in search of the perfect monogram to hang above our bed. I swear I must've looked at over 100 different fonts...GOOD LORD. I had no idea there were that many to frickin' choose from!! I finally found one I fell in love with, ordered that sucker & as soon as we got it up on the wall we realized the sucker didn't stick to the paint we used on the wall. So we beat the system. We hand painted that sucker. She ain't goin' nowhere now. I'm exhausted just thinking about it. But hey, it was worth it. 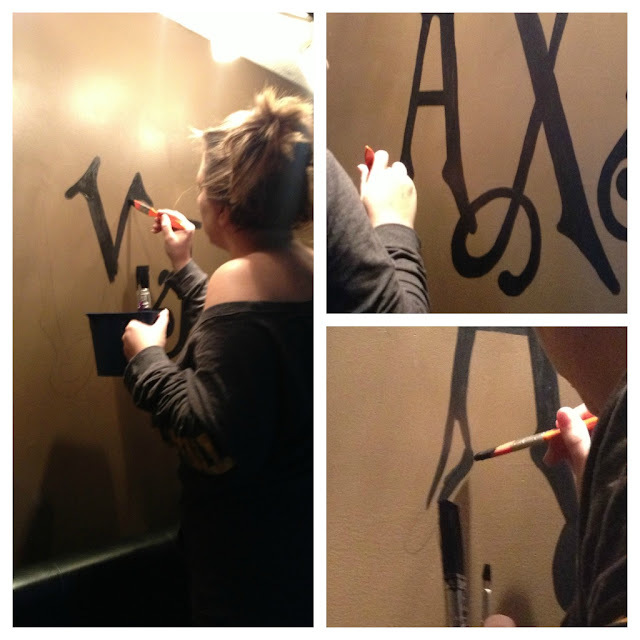 Hope you all had an amazing weekend, not involving hand painting a monogram on your wall. Linking up with Carly & Molly . And you should too. And as always, Sami & Leeann. Thanks ladies for hosting one of my favorite link ups week after week! Tootles! And please, say a prayer for me to make it thru this Monday. Well aren't you 2 clever?! I lovvve it and what a great use of your space! 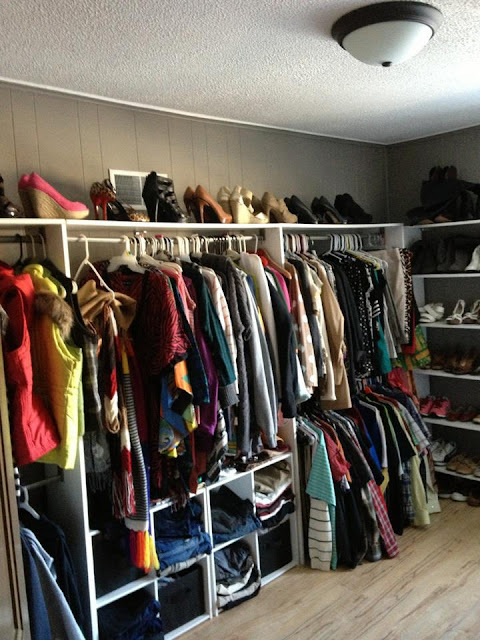 And any man that lets you use an extra room for your closet is a winner in my book! That looks AWESOME! What a great idea for the unused space. And the monogram turned out so well! I think this is just the cat's pajamas but I'm really going to need a testimony from Jon that you weren't the chief slave driver making him do all these projects ;) It looks SO FAB! Hi Anne! Found your blog on the weekend linkup. Your bedroom looks amazing, my husband and I are in the process of making our bedroom pretty (4 years after we moved in!). Love your blog! That's such a good idea!! I love how it turned out! WOW! What an awesome idea and a great use of space. The light is perfect, and the letters on the wall is personal. I'd do this at home if I could! What a fun, fun idea! 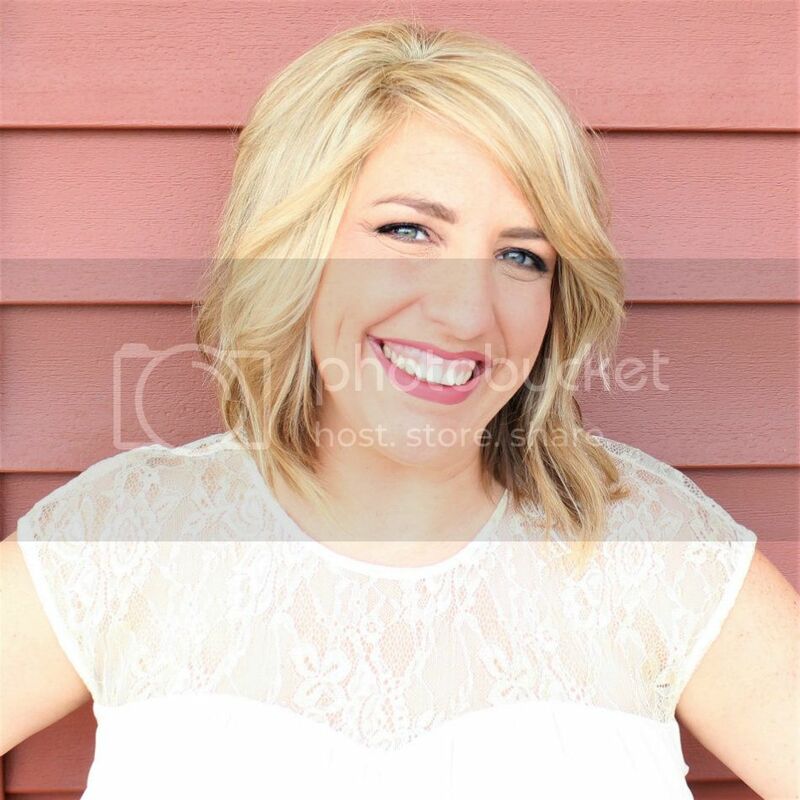 I am a new follower & found you via the linkup! It looks so good! I love the monogram! Our monogram is just cCc so I always get jealous of people with different letters. Lookin' good! You did an awesome job painting. Okay that was absolutely a genius idea. It looks great! This is so fantastic! What a great idea! And oh my goodness, your dressing closet? I am so jealous! Wow, that is seriously THE COOLEST idea I've ever seen. It looks like a hotel with your bed in that "alcove"! Seriously awesome. I am pinning this shiz. Looks great...not the bed in the closet, the frieking room sized closet you get to enjoy!!! WOW! I'm jelly. Your bedroom looks great too, I just can't get over your closet, haha! Was reading through Shades of Grey...and found your guest post, had to hop over, you're too funny. Totally cracked me up!